Veterans Day checkup: What's Obama done for vets so far? 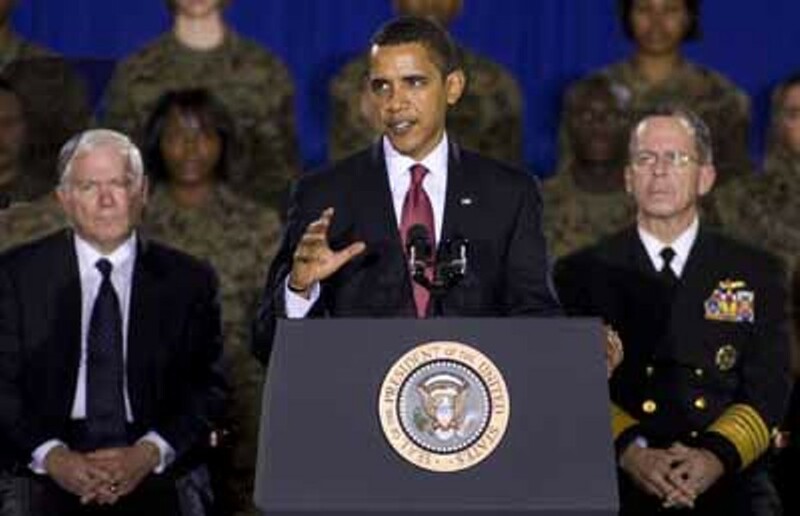 COMMANDER IN CHIEF: President Obama addresses Marines at Camp Lejeune, N.C. Feb. 27, 2009. It's the week of Veterans Day, a good time to see if things have improved or not for our military vets. I didn't serve in the military, but veterans and their concerns have been a personal point of interest for a long time. A college friend was killed in Vietnam, and a high school classmate was mentally wrecked by his experiences in that hellhole. Today, another friend has a son who's serving in Afghanistan. In my family, my father was in the Navy during World War II but didn't see any combat. Two great uncles, however, were in combat, one of whom, Uncle M.L., contracted malaria in the Philippines. He came home to take care of his wife, two children and a large farm, but was bedridden from time to time when his dormant malaria would recur, or as he phrased it, "it comes back on me." During those times, no one but a nurse and his wife could be around him -- much to my disappointment as an 8-year-old who once had to forego visiting Uncle M.L. 's farm to ride one of his horses. He often "bragged on" how well the Veterans Administration took care of him, providing the nurse and all needed medicines free of charge. Other wounded vets from that era told much the same story. By the time Vietnam rolled around, the VA wasn't the efficient, silver-plated organization it once was, and complaints about shoddy treatment started piling up. We don't need reminders that things didn't get any better for some time, culminating in the appalling conditions at Walter Reed Army Medical Center in Washington, D.C., that led to a greater public awareness of veterans' treatment. Today, more and more returning soldiers are besieged by Post-Traumatic Stress Disorder, spinal injuries, polytrauma (multiple traumatic injuries), and a need for prosthetics. But the VA has been underfunded, and the bureaucracy involved can be maddening due to a lack of coordination between the VA and the Department of Defense. • He announced a new VA budget of $112.8 billion, a 15.5-percent increase over the previous year. Among other things, the higher budget calls for hiring more staff, treating 122,000 more patients, and beginning the switch of patient records to an electronic system that can be accessed by all VA facilities. The increase will also pay for an uptick in education claims by veterans who are taking advantage of the Post-9/11 GI Bill, passed last year. • The American Recovery and Reinvestment Act added another $1.4 billion to the VA budget, to be used toward improving services, including grant money to states to build extended care facilities for vets, and the hiring of 1,500 new claims processors to speed up delivery of benefits. • The Joint Virtual Lifetime Electronic Initiative mandates that the DOD and VA work together to build a coordinated computer system that will provide accessible patient information from the day an individual enters military service throughout the rest of his/her life. This will remedy one of veterans' main complaints about the VA.
• In a related issue, the Obama administration is pushing for a measure that would let Congress approve VA money a year in advance, thus avoiding the delays for budget reasons that have plagued the agency. • Just two weeks ago, the VA and DOD held a joint Mental Health Summit in Washington, designed to "harness the programs, resources and expertise of both departments to deal with the aftermath of the battlefield." The initiative will include removing the stigma many soldiers feel about admitting to PTSD symptoms, and, finally, treating PTSD and traumatic brain injuries more fully, rather than how it's been dealt with in the past, as something to be merely contained enough to keep it from causing major social (or political) problems. • With more than 100,000 veterans going homeless on any given night, Obama proposes pilot programs with non-profits to specifically target vets' homelessness and its related problems. A more concrete plan is expected within a few months. This list still leaves much to do, but it's nevertheless a good start by the Prez to follow through on promises he made to vets. So on Veterans Day, when the country is full of hurrahs and heart-tugging nods toward the flag, remember that we still need to do a lot more to meet our commitment to vets. You can thank vets in a way that could make an actual difference: Contact the White House and your representative or U.S. senators in Congress, and tell them to do more for veterans, including improving the care given at VA hospitals. Don't just support our soldiers when they're overseas; make sure they're not having to fight battles with government bureaucracy when they come home.